Using a small sharp knife, cut all peel and white pith from lemon; discard. Cut flesh crosswise into 1/4″-thick slices; set aside. Line a large rimmed baking sheet with a kitchen towel. Cook broccoli in a large pot of boiling salted water for 1 minute. Using a slotted spoon, transfer to prepared sheet. Repeat in same pot with carrots, onions, asparagus, and fennel, returning water to a boil between batches. Place chicken broth in a small saucepan over low heat and scrape in seeds from vanilla bean; add bean. Bring to a simmer. Remove from heat; let infuse for 10 minutes. Heat 1 Tbsp. oil in a large pot over medium heat. Add carrots, onions, fennel, and garlic; cook for 1 minute. Add coriander, next 3 ingredients, and infused broth with bean. 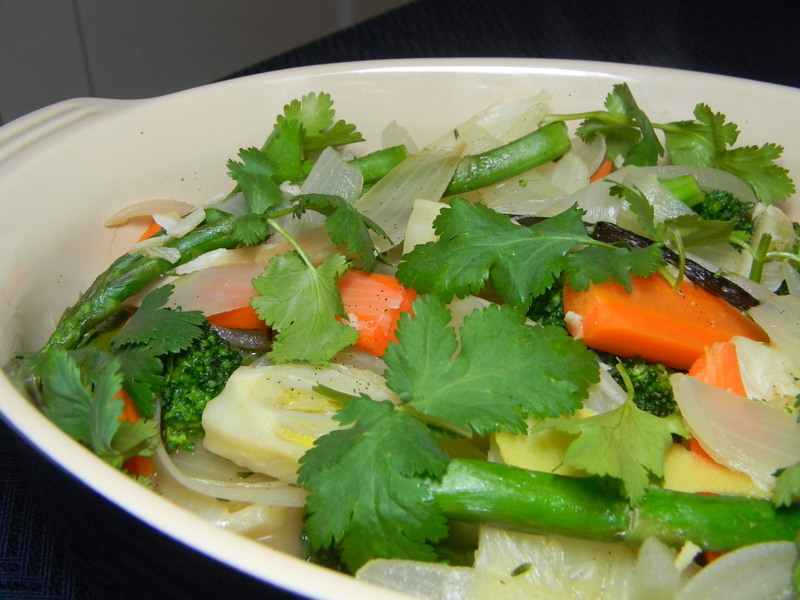 Cover with lid slightly ajar; simmer until vegetables are crisp-tender, 12–15 minutes. Stir in broccoli and asparagus. Using a slotted spoon, transfer vegetables to a warm serving dish. Bring broth to a boil and cook until reduced to 1 cup. Remove broth from heat; whisk in remaining 2 Tbsp. oil and 1 tsp. vinegar. Season with salt, pepper, and additional vinegar, if desired. Pour sauce over vegetables. Garnish with lemon slices and cilantro. This recipe is straight from Bon Appetit.